Translated by Hugh Matthews, originally published in Animage March 2017. Yeah, that’s right. Though, whether I’m animating girls or boys, I try to be conscious of the same details. So it’s not as if I had to change my methodology, in the end Yuri!!! on ICE just felt like an extension of my usual work. I always pay attention to how I show the gaze of the characters and the way their hair flows, plus I’ll also have them express something through the way they move their hands. ─ There were many cuts where you used the fingers of Yuri and the other characters to illustrate their feelings and their relationships with each other. You’re right about that. I was quite fixated on that kind of thing. ─ Was there anything you paid attention to when you were working on the anime character designs? I depict characters in such a way that viewers will think that they’re people who do exist. As in, I want them to go beyond being just an illusion. 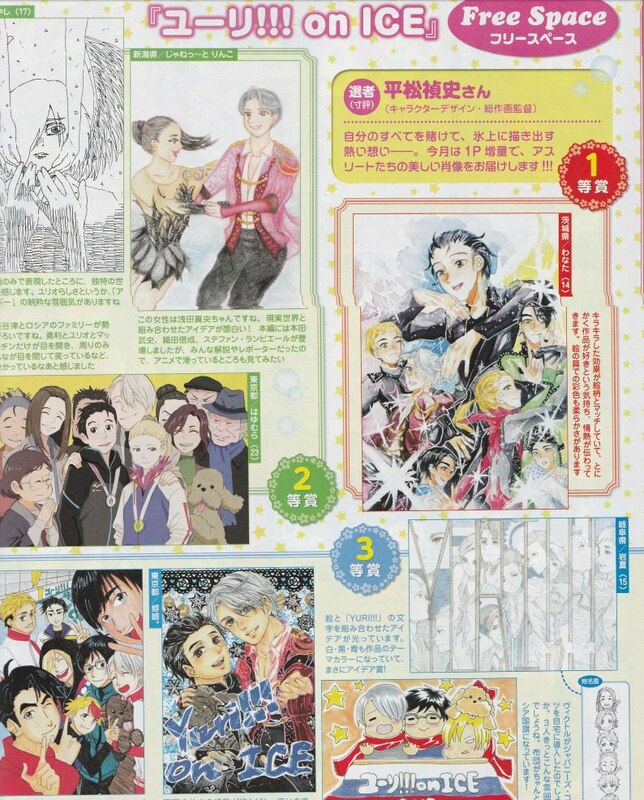 So, seeing the illustrations that fans have posted to Animage this issue, I get the sense that they love Yuri and the rest of the cast as if they were really right in front of them, and I’m really grateful for that. ─ When you were turning Mitsurou Kubo’s original concepts into animation designs, what was your approach like? Since Kubo is someone whose drawings really emphasize movement, both in terms of facial expressions and mannerisms, it was very easy to draw the animation designs. My personal style also happens to overlap with hers a fair bit, so it was pretty much fine if I just drew them without changing too much. Of course, I had to draw sketches of each character in a number of different patterns before we finalized the anime designs. Basically, I got all of the staff to look at them, and added details as we went along. ─ There aren’t really a lot of figure skating anime, so what was the image that came to your mind? I’d never really watched figure skating before ─ you could even say that my first encounter with the sport was watching it on TV around the time I decided that I would take part in this project. In any case, the idea of doing ballet on ice is just insane. I wonder who on earth came up with it? If speed skating is all about being fast, then figure skating focuses on the beauty. I’m really impressed by how they’re able to jump so nimbly with those blades attached to their feet. ─ Was there anything that you paid particular attention to with regards to capturing the physique of figure skaters and the way that they carry themselves? How they stand and how they sit, I’d say. I always make their back muscles look sharp and firm. So the reason that Yuri’s posture sometimes becomes a bit rounder is in order to show his lack of self-confidence. And skaters are also known for having tight butts and long arms and legs. ─ Yuri also has long arms and legs; it makes him look like a splendid, slender model. Right. It might seem somewhat different from what the typical Japanese person looks like, but director Yamamoto told me “Please let us dream” (laughs). ─ As for their faces, the red touches on the tip of their noses seem rather characteristic. That is also a feature of Kubo’s original designs. Since skating rinks are cold, people who have light complexions and long noses often get red noses. And thus we put a red touch on Viktor and Yurio’s noses by default. As for Yuri, it changes from cut to cut. ─ Please tell us about what you paid attention to when it came to animating each character. Since the relationships between Yuri, Victor and Yurio are what’s essential to the series, I had to think about how to make their differences stand out. The key point about Yuri is his unstable, low self-confidence. Victor is the complete opposite, and comes off as being rather detached. 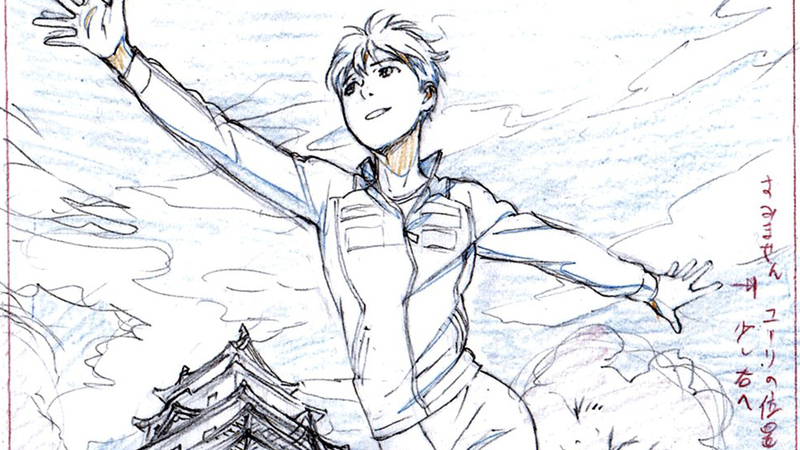 ─ Kenji Miyamoto, who was in charge of the skating choreography, said his image of Victor was that of a marble sculpture. Indeed, as in, he really is like a living legend. Victor has an adult presence but also feels child-like, plus he has this unpredictable nature that you’re never sure what he’s going to do. I’d say that it’s all part of his charm. As for Yurio, he’s like an unpolished piece of ore; he’s quite delicate, someone who’s easily shaken. Of course, that applies to Yuri too, but in Yurio’s case he behaves like a Russian delinquent even though he’s actually a rather delicate kid. So I feel that he and Yuri are the opposite sides of the same coin. Yuri comes across as timid, but somewhat surprisingly, he’s actually rather brash (laughs). ─ Regarding Yuri, It’s interesting how the impression he gives off can suddenly change at the flip of a switch. It’s like he just transforms into a demon out of nowhere. Yeah, you can tell he changes based on the look in his eyes (laughs). When Yuri makes up his mind, in that moment, his eyes sharpen and his eyes and eyebrows come closer together. Normally, he’s got this limp expression, like, with droopy eyebrows… but when that switch flips, suddenly his powers of concentration increase, and he fills the air with tension. 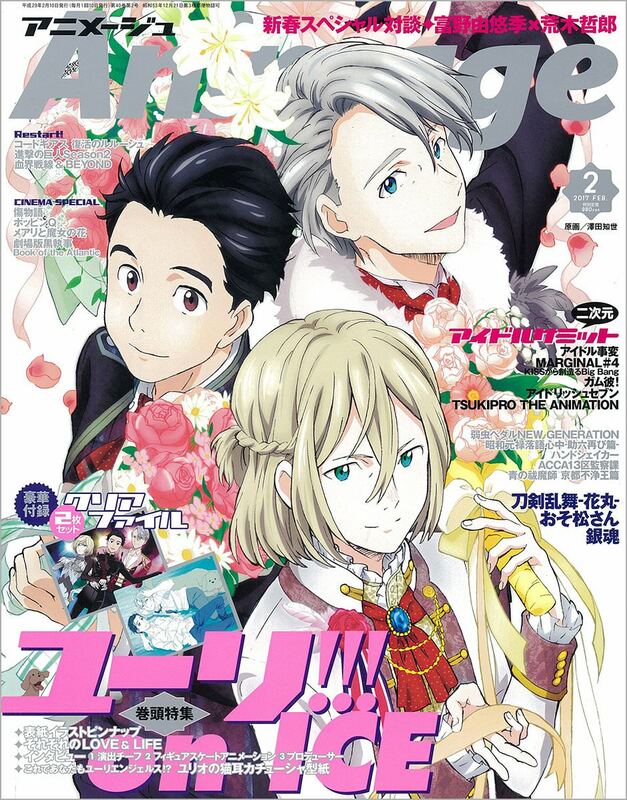 The Yuri on the cover of the February issue of Animage is about halfway between those two modes. ─ In the opening part of episode 1, when Victor said to Yuri “A commemorative photo? Sure,” he didn’t seem to have realized that Yuri was a fellow finalist. Yes, I believe that’s what it was. The impression that Yuri exudes on the ice is really different. When Yuri lets his fringe down and puts on his glasses, he seems a lot more childlike. Victor probably thought that Yuri was one of the junior skaters, and so he really was just trying to be nice to someone he figured was a fan of his. ─ On the other hand, Yuri was thinking that he’d finally met him as an equal. So hearing those words from Victor probably came as a bit of a shock to him (wry smile). ─ The narrator of the story, Yuri, has excessively low self-esteem, which is quite deceptive from an audience standpoint. He’s actually quite popular, isn’t he? Definitely. He just isn’t really aware of it himself. ─ As such, Minami’s role in the narrative is important, isn’t it? Yeah, Yuri actually has a lot of fans who love him and Minami is basically their representative. However, Yuri shuts everything out, including praise and criticism. In fact, he is more likely to take criticism to heart. Like, Yuri’s able to turn around and say “Well, that’s the kind of skater I am.” During the Cup of China, I thought that him shouting “Stupid Victor!” to himself internally and then landing his jump was very much in line with his character (laughs). ─ Makkachin is another important character, one that connects Yuri and Victor together. He has a fluffy manga-esque shtick to him. ─ From around episode 4 onwards, Yuri steadily opens up to Victor. The scene where he presses on Victor’s hair whorl was also rather amusing. Ah, for some reason, Victor worries about his hairline, doesn’t he? (laughs). At first, I didn’t understand the meaning of that scene. As Yuri pushes on that whorl with his finger, Victor responds with “Is it that dangerous/precarious?” and becomes rather depressed. ─ Is that why Victor has been designed with such a wide forehead? No no, of course not! (laughs). Because of how his hair flows and stuff, his forehead just appears wider from time to time. His hairline is fine. ─ Please go into detail about what you paid attention to when it came to animating the other skaters too. Since we had everyone’s personalities clearly defined right from the start, it was easy to depict them. First off, Chris and JJ do resemble each other a bit. They both have a fair amount of self-confidence, so they’re rather brazen. In Chris’ case, however, he needs Victor. I think he is the kind of person who’s like “I can shine precisely because Victor is around.” For JJ, he doesn’t really care about what’s going on around him, so he gives off this “Only me!” kind of feeling (laughs). I’d like to think that these differences came through in their expressions and character designs. ─ That pose JJ pose he does with his fingers does seem to be rather popular. It does, doesn’t it? That was in Kubo’s original designs right from the start. Though the way he orientates his left hand feels a bit impractical to pull off (laughs). ─ The part where Otabek becomes friends with Yurio was really interesting. Otabek gives off the impression of being manly, doesn’t he? A man of few words, he seems composed and secure, someone who doesn’t let anyone affect him. The impression Yurio got from Otabek, that feeling of resolution to follow your own path, must have seemed incredibly cool. ─ And Otabek told Yurio that he was “a soldier”, didn’t he? It applies to Yurio too, something about the figure Otabek cut must have resonated with him. I like Otabek myself, so I sort of get it ─ you can’t help but admire those types of people. That said, I still don’t know if it’s possible to become friends with him just like that, as Yurio did (laughs). ─ Popovich seems to be quite popular among the staff. I know right?! But if you look at it from a guy’s point of view, Popovich’s pitifulness is not something that you can think of as someone else’s business (laugh). If you get a group of guy friends together, there’s going to be at least one guy like that. Truth to be told, I think he’s a lovable young man. ─ How about Yuri’s best friend, Phichit? Phichit is a good kid – he’s cheerful, and isn’t particularly wary of anything. Like, upon seeing that Yuri and Victor have matching rings, he just shouts out “Congrats on your marriage!” (laughs). That scene was quite amusing, wasn’t it? ─ You also were the animation director for the opening and ending, weren’t you? Yes, that’s right. Though I only corrected the key animation a bit here and there. Since the visual style of the opening was more on the inventive anime side, I thought that we could have the characters appearing a little different from how they come across in the actual show. However, since the opening basically introduces the character, director Yamamoto told me that if we were able to clearly see their faces, then they must look like the characters in the series — hence the few corrections I made. But the appeal of chief animator Sunghoo Park’s flowing lines is still the core of that opening sequence. ─ Another highlight of that opening personally was how we saw a lot more colors suddenly bursting onto the screen when we got to the later episodes. ─ And what about the ending? Since Yuichiro Hayashi (who storyboarded, directed, and provided key animation for it) drew such wonderful art, I wanted to leave it as is, to have the sequence come to life as he’d envisioned it. The idea of going through Instagram photos one after another is also quite interesting. ─ Do you have a single favorite shot? I like the scene where Yurio is posing in front of a lion statue with a self-satisfied grin on his face. That’s Yurio for you alright! (laughs) I also like the shot where Yuri and Victor are messing with each other’s hair while bathing in that outdoors shower together. It’s got a certain vibe to it, so it’s really cool. ─ I’ve heard that the shower cut was originally going to appear in the show itself. When Yamamoto and Kubo were putting the story together across the 12 episodes, it seems like there were a lot of things they wanted to include, but there were simply no spare moments. It does feel like a bit of a waste. ─ The final episode left us with “See You NEXT LEVEL,” so if the show does happen to continue*, what kinds of scenes would you want to see in it? Something different from what we’ve done until now. I’d like to depict Yuri and the rest of the cast in new situations, such as a different setting or a different season. For example, we didn’t cover what they would do in summer in the show proper. Alternatively, seeing the three of tucked into a kotatsu during winter would be great, too. Other than that, perhaps we could visit different locations within Japan, or even other countries. America might be a good choice. Director Yamamoto should still have a lot of grand ideas that she couldn’t fit into the 12 episodes. In any case, I just want to watch Yuri, Victor, and Yurio getting along with each other. *The interview was published before the movie announcement. ─ If any one of them were missing, then we wouldn’t have arrived at that final scene in the last episode. That’s for sure. I’d like them to keep getting along with each other, from here on out. Originally published in Animage March 2017. Translated by Hugh Matthews.